Candidates can download their Hall tickets from the website aptwgurukulam.ap.gov.in with the help candidate details. Candidates will be able to download the AP tribal Welfare Intermediate admission hall tickets from direct link to download which will be available here and available on website only . No printed hall ticket shall be issued/posted to the candidate. Without aptwgurukulam.ap.gov.in hall ticket 2019, no candidate will be allowed to appear for the examination. After the aptwreis hall ticket page open. Your Admit Card will display. Download the APTWREIS Intermediate hall ticket 2019 and take the printout of it. APTWREIS Inter Admisssion Test Hall tickets 2019. 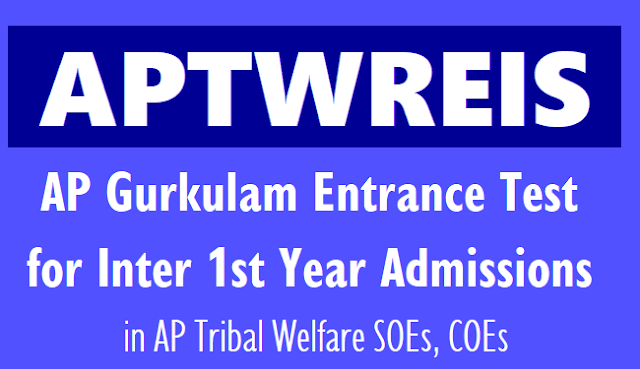 AP Gurukulam Entrance Test Hall tickets and Results Download for Inter 1st year admissions in AP Tribal Welfare.